At our next department meeting we’re going to discuss the idea of using a rubric to evaluate students’ class participation. In many of my college classes, participation was a factor in the final grade. I’m wondering about using this measure with younger students. I’ve seen many rubrics that focus on compliance with classroom rules under the guise of “participation.” They include categories such as arriving to class on time, having a pencil and other required materials, cleaning up the lab space, not distracting other students, or putting assignments in a designated place. While these behaviors contribute to an efficient class routine, this does not seem to be a complete picture of participation. I hope you start with a discussion of what “class participation” means. I suspect you’re looking for students involved in and learning from class activities. In a large group discussion, for example, students could ask questions, respond to questions, attend to information being presented, listen to and react respectfully to the comments of others, and take notes. In small group or cooperative learning, students contribute to the group effort, respect each other’s ideas, and fulfill the role they have taken on or have been assigned. During independent work, students focus on the task, applying their skills in reading, writing, or creating. There are many things a teacher can do to ensure that all students have opportunities to participate and that the classroom atmosphere is conducive to this participation [See the December 2009 blog]. 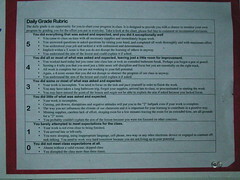 A rubric can communicate your expectations to the students, especially if the students keep a copy in their notebooks as a reminder or for self-evaluation. However, I’m a little wary of participation “scores” factored into a student’s report card grade. How could a teacher document participatory behaviors to calculate such a score? I know a teacher who would put a check mark next to a student’s name every time he/she answered a question. Getting check marks became a competitive sport in her class; students (and their parents) complained if they felt they were not being called on enough to get more points. Meanwhile, students who were not as outgoing or who were English language learners were often left behind in the competition. Other factors should be considered. If a student does not know an answer, does that count against him on the participation rubric? Is it acceptable to disagree with the teacher? What happens to participation levels in a class when several students try to dominate the discussion or belittle those who also try to participate? If a student performs well on tests, lab reports, and other assessments, is it fair to decrease a grade because he or she does not ask a lot of questions or volunteer answers? Is participation a form of “extra credit” used to enhance poor scores on assessments? Even when most students appear on-task, you may still have students staring out the window, doodling, or talking amongst themselves. Are they still participating? Many times as a student during a class discussion, I would gaze out of the window and think about what was being said, visualizing the connections between the new information and what I already knew. I wish teachers would have asked me what I was thinking about instead of telling me to stop daydreaming and pay attention. And if teachers would have looked at my sister’s doodles, they would have seen an artist at work, taking in the information and reformatting it graphically. Sidebar conversations between students may also be on-task, but we’ll never know unless we ask students about them. Perhaps students can help us learn more about different ways to participate. This entry was posted in Ask a Mentor and tagged class participation. Bookmark the permalink. Trackbacks are closed, but you can post a comment.